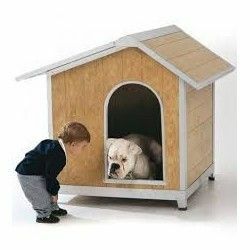 Beautiful house for dog, made of PVC, with the sunroof. Shelter for dogs Montana is a booth made completely of galvanised sheet and painted brown tones that mimic wood. It has a high durability and a high resistance to the elements. Shelter for dogs Montana is a booth made completely in galvanized sheet painted with tones of white and green that mimic the wood. It has a high durability and a high resistance to the elements.